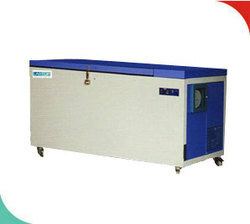 We provide our clients a qualitative assortment of Deep Laboratory Freezers that is inbuilt with non-CFC compressor and advanced temperature controller for the purpose of controlling the temperature up to -20 °C. Providing space for storage of chemicals at very low temperatures that can go as low as -30 °C, these advanced technology based Deep Freezers for Storing Chemicals provide complete safety to temperature sensitive materials that find use in research and other similar applications. Looking for Deep and Bio Freezers ?